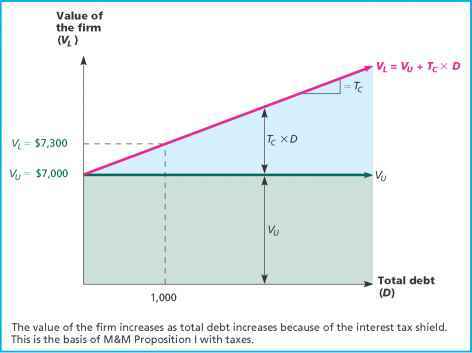 As Figure 17.4 indicates, the value of the firm goes up by $.30 for every $1 in debt. In other words, the NPV per dollar of debt is $.30. It is difficult to imagine why any corporation would not borrow to the absolute maximum under these circumstances. The result of our analysis in this section is the realization that, once we include taxes, capital structure definitely matters. However, we immediately reach the illogical conclusion that the optimal capital structure is 100 percent debt.